I wish to include some basic notions of Christian eschatology, which, because of the Resurrection of Christ give a reason for great hope to everyone — in particular, to those who suffer from evil spells. Our life, our earthly pilgrimage, and our suffering are not the fruit of a blind randomness; rather, they are ordered for our greater good and definitive friendship with God. Let us begin, then, precisely from paradise, the final goal and the reason for which we have been created. “Those who die in God’s grace and friendship and are perfectly purified live for ever with Christ. They are like God for ever, for they ‘see him as he is,’ face to face,” (CCC 1023). “The life of the blessed consists in the full and perfect possession of the fruits of the redemption accomplished by Christ. He makes partners in his heavenly glorification those who have believed in him and remained faithful to his will. Heaven is the blessed community of all who are perfectly incorporated into Christ” (CCC, no. 1026). A question arises spontaneously: What need did the Trinity have for creatures, for men and angels, when It was already perfect and absolutely sufficient in Itself? The Trinity did it solely out of love, gratuitous and unconditional love for us. The advantage is solely ours: love, joy, and happiness, for all, in paradise. There are degrees of participation in the joy and love of God. This degree of rank is given according to the level of sanctity each person has reached during his lifetime: the joy of St. Francis of Assisi, for example, will be different from that of the good thief. There is a difference between men on earth, and there will be a difference in paradise. It is similar to what happens with the stars in heaven: there are those that shine brighter and those that shine a little less. So also it will be with men in the glorious resurrection: all of us shall be resplendent, but each one with a different proportion. Each one will have that maximum of splendor and happiness that he is personally capable of, based on how he has lived his life. Some will have a greater capacity and others less, but without envy or jealousy toward each other. Indeed, each one will know complete joy. A verse from Dante’s Divine Comedy comes to mind: “In his will is our peace.” In paradise there is no jealousy; each one is in the will of God, and in His will there is peace. Eternal peace is definitive, where each tear, each sorrow, and all envy will be wiped away. Purgatory is the place, or, better, the state to which come the souls that have need of a purification and therefore have not been immediately admitted to contemplate the face of God. This purification is necessary in order to arrive at sanctity, the condition that heaven requires. The Catechism speaks of the souls in purgatory: “All who die in God’s grace and friendship, but still imperfectly purified, are indeed assured of their eternal salvation; but after death they undergo purification, so as to achieve the holiness necessary to enter the joy of heaven” (no. 1030). This article is from a chapter in An Exorcist Explains the Demonic. We can understand that there are gradations or diverse states in purgatory; each one accommodates the situation of the soul that arrives there. There are the lower strata, more terrible because they are closer to hell, and the more elevated that are less terrible because they are much closer to the happiness of paradise. The level of purification is linked to this state. The souls in purgatory are in a state of great suffering. We know, in fact, that they can pray for us and that they can obtain many graces for us, but they can no longer merit anything for themselves. The time for meriting graces finishes with death. Purged souls can, however, receive our help in order to abbreviate their period of purification. This occurs in a powerful way through our prayers, with the offering of our sufferings, paying attention at Mass, specifically at funerals or at Gregorian Masses, celebrated for thirty consecutive days. This last practice was introduced by St. Gregory the Great in the sixth century, inspired by a vision he had of a confrere who died without confessing himself and, having gone to purgatory, appeared to him, asking him to celebrate some Masses in his favor. The pope celebrated them for thirty days. At that point, the deceased appeared to him again, happy for having been admitted to paradise. One must take care: this does not mean that it will always work this way: that would be a magical attitude, unacceptable and erroneous toward a sacrament. In fact, it is solely God who decides these matters when He wills it through His divine mercy. On the subject of Masses, it is necessary to say that they can be applied to a particular deceased, but, at the last moment, it is God who destines them to those who have a real need. For example, I often celebrate Masses for my parents, whom I believe in my conscience are already in paradise. Only God in His mercy will destine the benefits of my Masses to those who have more need, each one according to the criteria of justice and goodness reached during his life. Regarding all that I have said, I wish warmly to advise that it is better to expiate suffering in this life and become a saint than, in a minimalist way, to aspire to purgatory, where the pains are long-lasting and heavy. The book of Revelation says that “the great dragon was thrown down, that ancient serpent, who is called the Devil and Satan, the deceiver of the whole world — he was thrown down to the earth, and his angels were thrown down with him” (Rev. 12:9). Why were they hurled down to the earth? Because the punishment they were given is that of persecuting men, trying to lead them to eternal hell, rendering them their unfortunate companions for an eternity of suffering and torment. How can this drama, which involves everyone, enter into the plans of God? As we have said, the next reason is the liberty granted by God to His creatures. Certainly we know that the mission of Satan and his acolytes is to ruin man, to seduce him, to lead him toward sin, and to distance him from the full participation in divine life, to which we have all been called, which is paradise. Then there is hell, the state in which the demons and the condemned are distanced from the Creator, the angels, and the saints in a permanent and eternal condition of damnation. Hell, after all, is self-exclusion from communion with God. As the Catechism states: “We cannot be united with God unless we freely choose to love him. But we cannot love God if we sin gravely against him, against our neighbor or against ourselves” (no. 1033). The one who dies in mortal sin without repenting goes to hell; in an impenitent way, he has not loved. It is not God who predestines a soul to hell; the soul chooses it with the way [the person] has lived his life. We have some stories about hell that, because they are taken from private revelations or experiences, do not bind the faithful, but, nevertheless, have a notable value. I have spoken on more occasions in my books and in my interviews of the experience of St. Faustina Kowalska, who in her diary writes of her spiritual journey to hell. Being in the kingdom of hate, damned souls are subjected to the torment of the demons and to the sufferings they reciprocally inflict on one another. In the course of my exorcisms I have understood that there is a hierarchy of demons, just as there is with angels. More than once I have found myself involved with demons who were possessing a person and who demonstrated a terror toward their leaders. One day, after having done many exorcisms on a poor woman, I asked the minor demon who was possessing her: “Why don’t you go away?” And he replied: “Because if I go away from here, my leader, Satan, will punish me.” There exists in hell a subjugation dictated by terror and hatred. This is the abysmal contrast with paradise, the place where everyone loves one another and where, if a soul sees someone holier, that soul is immensely happy because of the benefit it receives from the happiness of another. Some say that hell is empty. The response to this affirmation is found in chapter 25 of Matthew’s Gospel, where it speaks of the Last Judgment: the upright will go to eternal life and the others, the cursed, will go to the eternal fire. We can certainly hope that hell is empty, because God does not wish the death of a sinner but that he convert and live (see Ezek. 33:11). For this He offers His mercy and saving grace to each one. In the Gospel of John Jesus says: “If you forgive the sins of any, they are forgiven; if you retain the sins of any, they are retained” (John 20:23); thus He insists on our continuous conversion supported by the grace of the sacraments, in particular the sacrament of Penance. The Catechism speaks of the particular judgment: “The New Testament speaks of judgment primarily in its aspect of the final encounter with Christ in his second coming, but also repeatedly affirms that each will be rewarded immediately after death in accordance with his works and faith” (no. 1021). The first thing that I would emphasize is precisely this last: the final criterion of our judgment will be the love that we have had toward God and toward our brothers and sisters. How, then, will this particular judgment occur? At times, I run into persons who are convinced that immediately after death they will meet Jesus in person and that He will give them a piece of His mind for some of their dolorous affairs. Frankly, I do not think that it will happen like this. Rather, I believe that, immediately after death, each of us will appear before Jesus, but it will not be the Lord who will review our lives and examine the good and the bad each of us has done. We ourselves shall do it, in truth and honesty. Each one will have before himself the complete vision of his life, and he will immediately see the real spiritual state of his soul and will go where his situation will bring him. It will be a solemn moment of self-truth, a tremendous and definitive moment, as definitive as the place where we shall be sent. Let us consider the case of the person who goes to purgatory. It will involve the sorrow of not immediately going to paradise that will make him understand that his purification on earth was not complete, and he will feel the immediate need of purifying himself. His desire of acceding to the vision of God will be strong, and the desire for liberation from the weight of the pains accumulated during his earthly life will be compelling. This is one of the most difficult realities to understand. The Last Judgment coincides with the return of Christ; however we do not know the precise time it will occur. We know that it will be preceded immediately by the resurrection of the dead. In that precise moment, the history of the world will definitively and globally end. The Catechism again specifies: “In the presence of Christ, who is Truth itself, the truth of each man’s relationship with God will be laid bare [cf. John 12:49]” (no. 1039). The essential question is: What is the concrete rapport that each man has with God? As I have mentioned, the solemn response is found in the Gospel of Mathew. The saved and the damned will be chosen on the basis of their recognition or rejection of Christ in the infirm, in the hungry, and in the poor (Matt. 25:31–46). Two essential elements emerge from this. The first is a division, a schism, between those going to paradise and those going to hell, between the saved and the condemned. The second regards the manner in which this judgment will be accomplished — with love. God’s Commandments and every other precept are summarized solely in one commandment: “[L]ove one another as I have loved you” (John 15:12). We can easily understand that this command is addressed to each human conscience in every age, including those who lived before Christ and those, who today, as in centuries past, never heard anyone speak of the Son of Man. Therefore, the finale of this stupendous passage is the beautiful passage from Mathew: “Truly, I say to you, as you did it to one of the least of these my brethren, you did it to me” (Matt. 25:40). If each man — apart from his religion, his culture, his epoch, and any other circumstance — has loved his neighbor, he has also loved the Lord Jesus in person. Any rapport with our brothers and sisters in any locality, any age, or any situation is, all in all, a rapport with Jesus Christ in person. Each human creature who achieves fulfillment in his human relationships is, at the same time, relating to God. For this reason, the love of neighbor is the fundamental precept of life. John the Evangelist helps us to understand that we cannot say that we love God, whom we cannot see, if we do not love our brother, whom we can see (cf. 1 John 4:20). The love that will judge us will be the same love that we have (or have not) practiced toward others, the same love that Jesus lived in His earthly experience and taught us in the Gospels, the same love to which we are entitled through the sacraments, through prayer, and through a life of faith. The ability to love comes from grace, and it is much reduced in those who do not know Christ; and even more so in those who know Him but do not follow Him, a choice that assumes a serious sin. Indeed, Jesus said: “He who believes and is baptized will be saved; but he who does not believe will be condemned” (Mark 16:16). God’s compassionate glance and His desire to live in total communion with us opens our hearts to the hope that each sin and each failure inflicted on man by his great enemy, Satan, will be looked upon with the eyes of a loving and accepting Father. Therefore, let us live full of hope, because we know that, even in the difficulties of our life’s journey, God will wipe away all the tears from our eyes. On that day “death shall be no more, neither shall there be mourning nor crying nor pain any more, for the former things have passed away” (Rev. 21:4). Editor’s note: This article is adapted from a chapter in Fr. 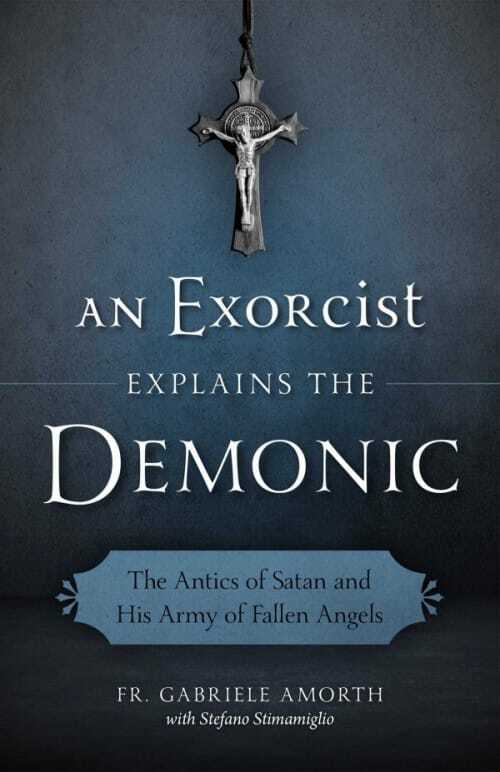 Amorth’s An Exorcist Explains the Demonic: The Antics of Satan and His Army of Fallen Angels, which is available from Sophia Institute Press. Find more of Fr. Amorth’s work on Catholic Exchange by clicking here. A priest of the Congregation of San Paolo, Fr. Gabriele Amorth (1925-2016) was internationally recognized as the world’s greatest exorcist. His mission of expelling the devil through incessant dedication has earned the gratitude of thousands of believers and the esteem of the most important authorities of the Catholic Church. He has written various successful works and has a very popular radio program on Radio Maria in Rome.